This October at Natural England’s Shapwick Heath National Nature Reserve saw the opening of the brand new, Defra funded, Noah’s and 70 acres Hides. The old Noah’s Hide, originally built by Melvyn Yandle over 15 years ago was very popular, however due to its small size and open aspect it could be a bit chilly and on busy days, there could be a queue outside the door. 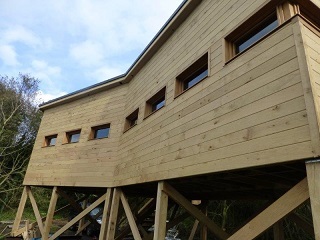 Worth the wait, the new Noah’s hide is much larger and glazed, with enough space for 30 people, and built in cavities for nesting bats and birds. With not a queue in sight, the two new hides will continue to provide visitors to Shapwick with an excellent place to view the amazing wildlife here. Sightings from the hide so far include Bitterns, Kingfishers and Marsh Harrier.